In spite of The Princess telling her dad last night that I spend all day on the computer (she was mad at me at the time and also said she thinks I want to sell her - for the record I do not want to sell her), I have spent very little time on the computer the past few days. My lack of comments around the blog world and my last post being on Friday are proof of that. I just confirmed with The Princess that I have not been on the computer hardly at all today, so I am good-to-go guilt-free for a few minutes. So here's a quick peek into what I have been doing instead of blog writing and reading the past few days. I ran my Virtual Race for Autism 5K. 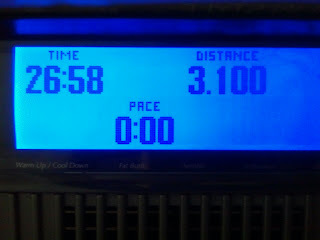 I ran 3.1 miles at half marathon pace as part of a short 4.1-mile tempo run today. It's taper week since I have a half marathon on Saturday, so I am taking it easy. Here's my proof that I ran it. And if I can stop being so busy (and sometimes lazy), I'll post a pic of me with my race bib. And if you haven't signed up for the race yet, it's not too late. Just click the link above. 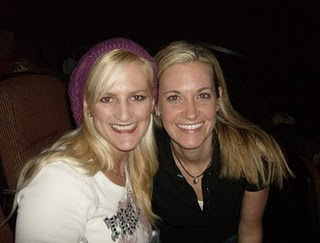 My awesome cousin stopped by yesterday to say goodbye to my girls and me. Stacey is moving to Hawaii to be with her love. Not a bad reason or a bad place to move. She will be missed terribly (already is missed actually), but I couldn't be more excited and happy for her. And knowing we'll see her when we go to Hawaii in February makes it a little easier. We have spent a lot of time lately staring out the window trying to find the baby birds that are residing in our backyard. 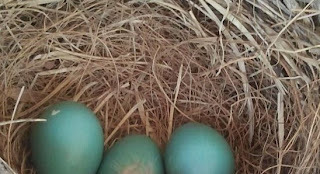 A month or so ago, our neighbor showed us a nest by her house with three little blue eggs inside. Over the next week or so, we checked the eggs daily when the mommy bird was off getting some exercise. We didn't dare get too close when she was there after our neighbor warned us that mommy bird will dive at your head if she thinks you are after her babies. Then when we peeked in the nest bout two weeks ago, there were three little birds. So we have checked on those little baby birds every day for the past two weeks. It has been fun and amazing to watch how quickly they have grown. Sorry the eggs are cut off on the bottom, but I edited this picture because a fourth baby didn't make it and the proof was a little too much to stomach. The nest was up pretty high so I just had to stick my phone up there and hope it was aimed right when I took the picture. This was the best I got. Saturday when the hubs lifted The Princess up to look in the nest, one of the birds panicked and toppled out. After chasing the bird around the neighborhood (it couldn't fly yet) the hubs tried to put it back in the nest, but the other two babies panicked and toppled out too. 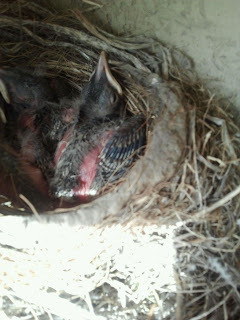 Now we have two baby birds residing in our backyard and our neighbor has one in hers. Since the babies like to hide, except when the mommy and daddy birds come around with worms hanging out of their beaks, we spend a lot of time trying to find them in the bushes. They are getting close to being able to fly and will probably only be around a few more days. It will be a sad day for my girls when the baby birds are gone. Can you find the two baby birds and the mommy in this picture? It's like Where's Waldo with birds. Nice work on the Virtual 5k! I am excited to see how Alicia does this weekend! It is an amazing thing for an amazing cause! you and your cousin look so similar! Nice job on your run and your daughter's comments crack me up! Maybe I'll see you this race. I'll be holding a sign again...can't miss me. I have been thinking about you all week! Good luck on the half. Let's see a PR girl! Nice job on the 5K! I have to do that this morning. I hope your daughter is less convinced she is for sale. I remember making that same accusation at my parents years ago. We found a nest in the tree on our property...while we were trying to trim it. Scared the hell out of the hubs and I and I am surprised the mama bird didn't attack us. Way to go on the 5k! I'll have to check out Alicia's blog! Too cute on the baby birds! Certainly exciting stuff for the kiddos! Hope they make it out of the yards safely soon. We just found a nest under our top deck where we BBQ. If we look through the slats we can see their tiny little faces looking up at us. Now I'm worried that with the weather change we are out there disturbing them too much. Love the comments from your princess. Kids are so funny! Great job on the run and hopefully you can make it to Yogurtland on Friday! woohoo! I joined the virtual 5k. Thanks for blogging about it. thanks for the comment!!!!! and I absolutely cannot wait to meet you on friday!!! woo hoo!!! it should be fun! baby birds are so cute...I did the same thing when I was little once though. I just kept spying and spying until they tried to fly away too soon because they were scared. oops. I just couldn't help it though. I thought they were "my" baby birds! haha! anywayyy!! yay!!! I am so excited for this weekend!! Way to go on your 5K! That's a great time when you're not actually in a race and have everyone around to push you! Those baby birds are so cute. We've had some similar experiences. It's always hard when they finally grow up and leave! Love baby birds!! Great snap of the eggs (thanks for the editing!). You condensed a ton of info into this post, but for the time being, PETP really wants to know why you were considering selling your Princess. Is she already being recruited by European soccer teams?